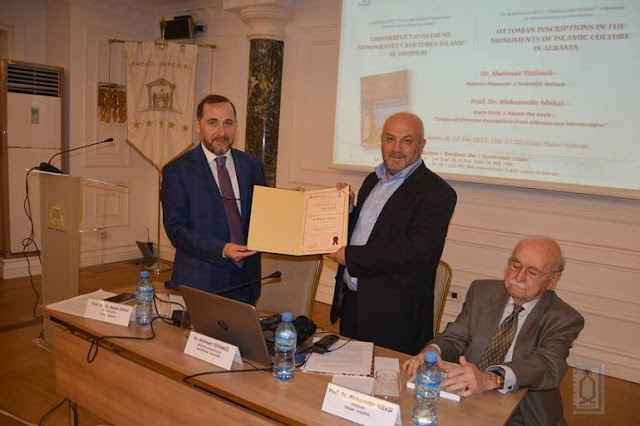 With the presence of important personalities of culture and science in Tirana, the book "Corpus of Ottoman Inscriptions from Albania and Montenegro" is promoted by scholar dr. Mehmet Tytynxhu, recently published in English and soon to be published in the Albanian language by the Albanian Institute of Islamic Thought and Civilization (AIITC), the institute which organized the promotional activity in the premises of Hotel Imperial on Friday, in Tirana. In the opening remarks of the event, the director of AIITC, Dr. Ramiz Zekaj stressed the importance of this publication for Albanian culture and science and highlighted some of the key documentary values that carry these inscriptions. According to him, "the inscriptions found in the monuments of Islamic culture in the Albanian lands are a special aspect, which has come as a legacy of the Islamic Albanian culture to the present day. They capture a nearly five-centuries-old timespan, beginning in 1466 and ending in 1942 and shed light on some important moments of Albanian historiography. Through them, we also know the life and work of some Albanian personalities as big viziers, Pashas, leaders, insurgents who played an important role in the history of the Albanian people. In many other inscriptions is provided information about the times when important personalities and missionaries of Islamic faith such as the Mufti, the Imamate, the Hatibah, the Myezin, the Dervishes, the Fathers, the Vaia and the Theologians have started their mission. At the same time in these inscriptions have information about the protagonists of various ranks and natures, are mentioned the benevolent names that devoted part of their possessions to charity works. Dr. Ramiz Zekaj, at the end of his speech, informed the attendees that the book "Corpus of Ottoman Inscriptions from Albania and Montenegro" will soon be in the hands of Albanian readers, because the work for translation into Albanian by the Albanian Institute of Thought has begun Of Islamic Civilization (AIITC), an institute that for 2 decades promotes the most important developments in the sphere of Islamic culture and civilization.